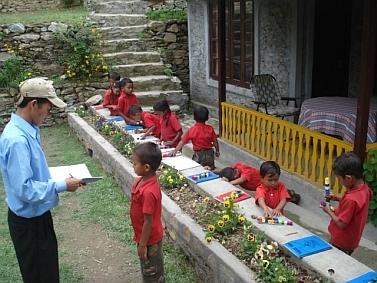 When General Jimmy Singh, set up the Samthar Farm House , Charles Lepcha was working as a teacher in the village primary school, and was perhaps the only English speaker in the area. He was employed by Gurudongma Tours & Treks, as a part time guide to take tourist around the village. Soon he devised walking circuits to show visitors the various activities and for interaction with the local folks. Henry Unwin the first volunteer at the Awake and Shine School, needed a helper who could assist him in interaction with the children and parents. Charles was roped in for the job. He had a flair for building rapport with the children, and became a teacher as the school grew from one to three classes. He helped in many ways in evolving the ethos of the school, as also the methodology. Charles is now the head teacher of the Pre School section at Awake and Shine School He also runs his own home stay, and acts as a tourist guide. His earnings have increased five fold.